In case you didn’t know, I really like to take pictures. One thing I like to do every year is sort through my own photos on my camera roll and pick out the top 100, 30, then the top 10, then my top 3, just for fun. Since I am immobile until I get my cast off next week, it’s a good time to do my “Year in Review” stuff. Right now I have 900 or so from the past year to sort through. One of the secret reasons I take so many photos is because it causes me to reflect deeply on all the beautiful moments we shared as a family. As I’ve sorted through them in the past few days, I was struck by a few things I thought I’d share. I’m proud of my family for sticking together and pulling closer to one another than we’ve ever been. I’m proud of my girls for loving each other well, sticking up for each other, cheering for each other and making our lives better by becoming the beautiful young ladies they are inside and out. I’m proud of my husband for pulling through the most difficult year he’s ever had-for loving me when I’m unloveable, for supporting his mom through the death of her husband, for driving the girls to a hundred practices, and being the dad who is all up in their face at every lacrosse game taking their pictures, watching them shine, making them glow with the joy of being deeply loved. I’m humbled by the grace I’ve come to know through brokenness. My physical body and my heart have been broken this year, but I’ve come to see God and His ways a little more clearly. I’m humbled by the love of many people poured out to our family through meals, gifts, calls, cards, and a thousand acts of kindness. My extreme independent self is humbled to have to send my husband twenty texts a day, asking for things I cannot get for myself because of not being able to walk for the past two months. Looking back I see with blazing clarity that Grace and Love and Light and Joy are mine. I’m grateful for the ways God is showing me sides of Himself I would never see if it weren’t for the circumstances of this year-the high’s, the low’s and the in-betweens. God is Good. He is love. He is light. These things are true. These things I know. And I’m grateful. Though everything around me is changing, He never changes. And that, my friends, is good news. I’d love to hear what you’re reflecting on as this year draws to a close. I have nothing but time as I will be immobile for at least another week or so. Drop me a message. Send me an email. Write me on Facebook. I sincerely would love to hear from you. If not, have a very Merry Christmas! Great read!! Glad it’s off finally!! This year has been a whirlwind for us.. Buying out house. Getting married.. Moving up w new job/responsibility.. And even more coming for next year. Always reminded that God has provided for us and it’s because of the people and provisions we’re given in life that make it possible. Love your photos and your reflections for the year! I am still processing our year. I was just looking over my list of ‘resolutions’ that I made at the beginning of last year. Only one of them was accomplished (and I pretty much set it up as a no fail situation- ha!). Malachi begins with God telling Israel, “I have loved you.” We have this framed in our house. It is a great reminder to me, no matter what the year, that God has been faithful always and will continue to be faithful forever. I have no idea what 2014 holds, but after 2013 my resolutions have changed from a list of things to do into a list of what I know to be true. The rest can take care of itself. Hope your foot/ankle/leg/body is healing quickly and you are able to get around a little more each day! 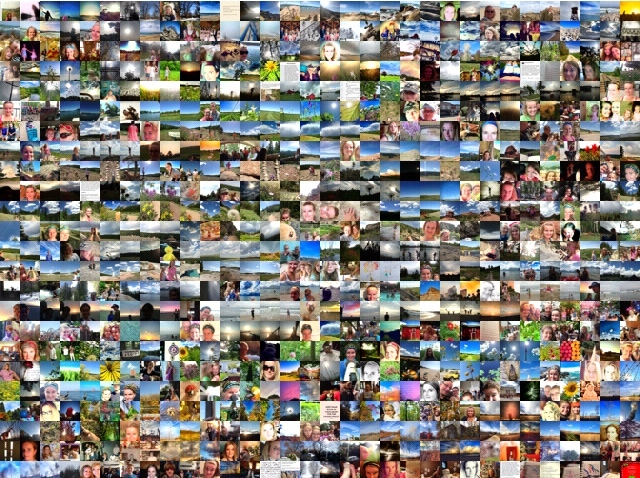 It is so justified that you would end the year with a collage of your pictures. Just the other day you asked which one was our favorite out of several. It is so impossible to provide you a answer. I also see things in life like you do. Beautiful blue skies and white cotton clouds. I see the dew on the flowers and grass and the flutter of the butterflies. Today I went out and purchased another camera to try once again to get pictures anywhere close to the ones you take. God gave you a gift. Thank you for sharing it with us. I am glad your leg is better.